While brainstorming television shows worthy of nail art, I had ideas of nostalgia, considered supernatural-esque shows since it is Halloween month, but ultimately settled on five shows my daughter likes (and one cheat day that is more on the nostalgic side even though I didn't watch it, just wanted an easy mani because I was out of time). 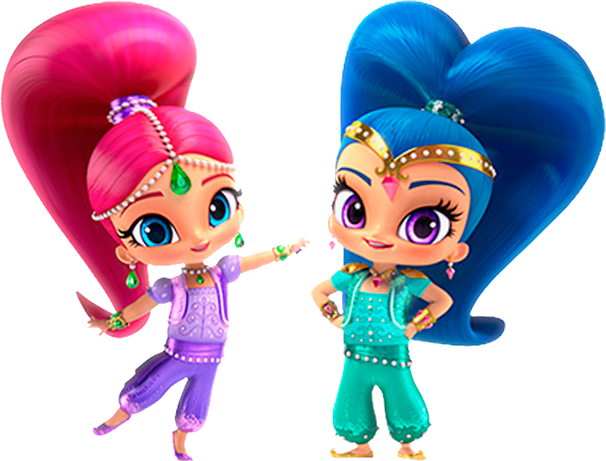 For the first one, I picked Shimmer and Shine, a cartoon about genies (they might be sisters, I have no idea), and used half-pearls to replicate their head pieces. Edited to add: my six-year-old has confirmed the genies are, in fact sisters, and she insists they're twins.... I'll nod and agree as she tells me a five-minute story about the genies and their pets, then retrieves half a dozen Shimmer and Shine toys to show me "see, I told you I was right about [insert any fact about the cartoon here]". If anyone cares, apparently there's a pet tiger somewhere with a blue jewel on his head. I mean so that's cool.